Eugène Delacroix (1798–1863), Medea (1838), oil on canvas, 260 × 165 cm, Palais des Beaux-Arts de Lille, Lille, France. Wikimedia Commons. So far in Book 7 of Ovid’s Metamorphoses, Medea’s sorcery has worked for the good, in enabling Jason to win the Golden Fleece, and in making his father Aeson young again, at no cost to Jason’s lifespan. In the following brief summary of Medea’s downfall, Ovid tells us how Medea’s powers are abused, and bring disaster. the same time juices of great potency. to find some udder with its needed milk. The Peliades are hooked, and plead with Medea to do the same to Pelias. She sets out to gather her magic herbs and other ingredients, and to prepare her potion once more. As that is under way, Medea urges the Peliades to drain the blood from Pelias in preparation for his treatment, by cutting his throat and other sites of major blood vessels. The daughters cannot bear to watch one another, but attack their father while he is still in bed. He tries to prop himself up on his elbow and ask them what they are doing, but is cut short as Medea plunges his body into the boiling cauldron, which now contains water, not the magic potion. of her own husband, Jason. Medea finally flees again to Athens, where she marries King Aegeus. Few patrons would, it seems, have wanted a painting of these terrible events to hang on the wall of their home. They have thus been frequently portrayed in other arts, but relatively seldom painted. Some fine depictions on canvas have also been lost, including one by Poussin. There are still some excellent survivors, though. Georges Moreau de Tours (1848-1901), The Murder of Pelias by His Daughters (1878), oil, further details not known. Wikimedia Commons. 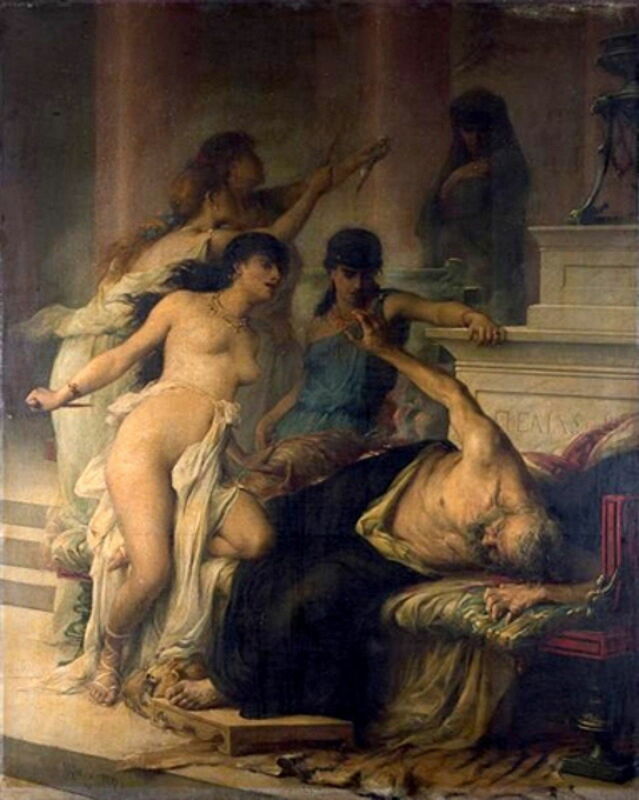 Georges Moreau de Tours’ The Murder of Pelias by His Daughters (1878) is one of very few paintings to show the Peliades committing this horrendous act. The old man is resting rather uncomfortably on a couch, behind which his name is inscribed in Greek. Medea shrinks into the shadows behind, her face half-covered, as the young women set about Pelias with their daggers. The daughter at the back appears to be offering Medea a knife so that she can join in, but she sits impassively in front of her boiling cauldron. Richard Dadd’s watercolour of Jason and Medea, or The Flight of Medea with Jason – Chief of the Argonauts, shows Medea fleeing on foot with Jason, rather than in her sky chariot, which is in accord with non-Ovidian accounts of this myth. 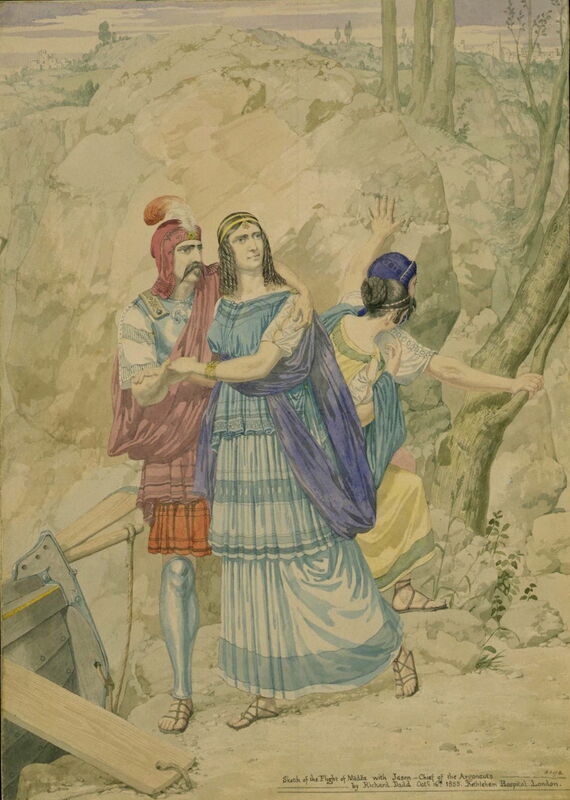 Iolcus is shown in the distance, and Medea’s maid is watching to see if they are being pursued. Painted while Dadd was in Bethlem Hospital, Medea’s masculine appearance probably results from his lack of access to female models. Ovid’s brief mention of Medea’s murder of her own sons has proved a more popular theme in painting. Eugène Delacroix’s first version, titled simply Medea (1838) and now in Lille, captures the scene well. The mother looks anxiously into the distance, to see if she is being followed, or there are any witnesses about. The boys seem to know what is about to happen: one is crying as Medea’s arm is holding him by his neck, and the other is hiding under her skirts. 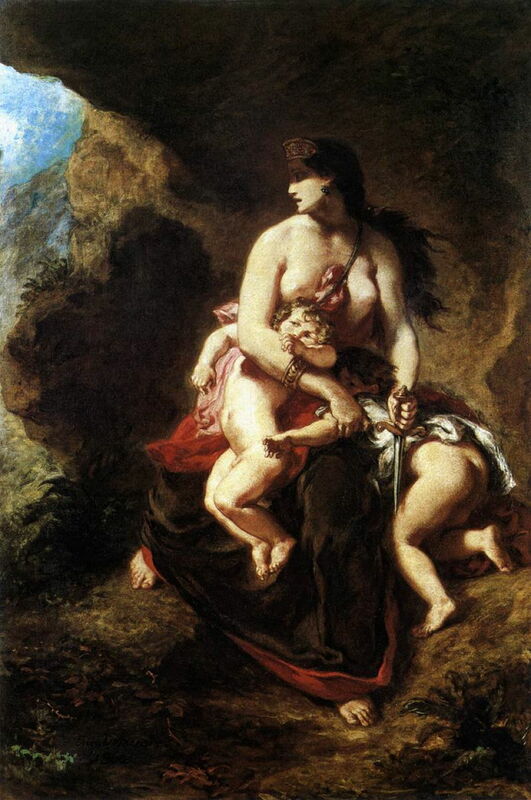 Eugène Delacroix (1798–1863), Medea about to Kill her Children (1862), oil on canvas, 122 x 84 cm, Musée du Louvre, Paris. Wikimedia Commons. Delacroix made at least two later copies, including Medea about to Kill her Children (1862) which is half the size, and now in the Louvre. 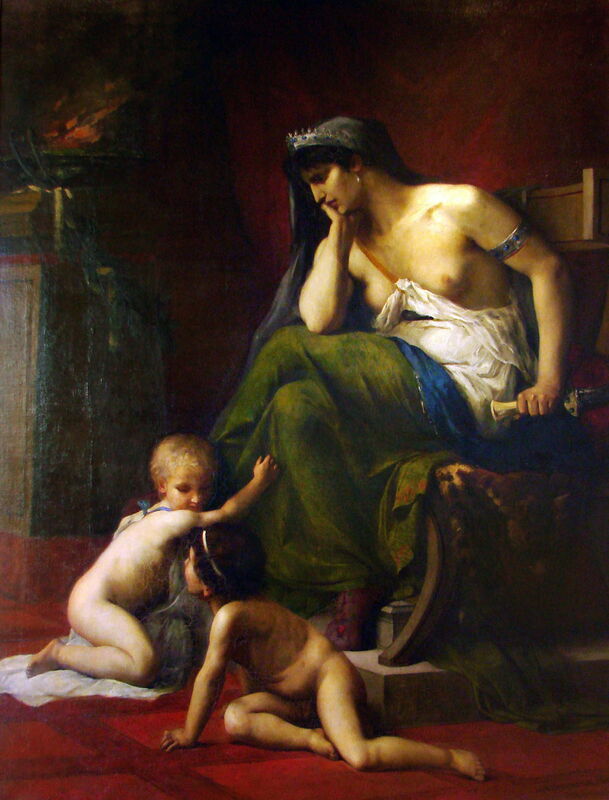 Henri Klagmann (1842-1871), Medea (1868), oil, dimensions not known, Musée des Beaux-Arts de Nancy, Nancy, France. Image by Vassil, via Wikimedia Commons. 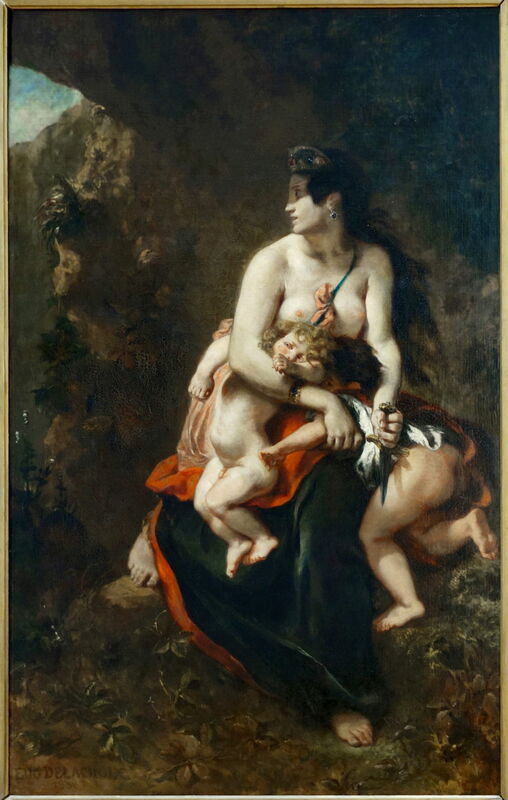 Henri Klagmann’s Medea (1868) shows the boys playing at mother’s feet, as Medea, grasping the handle of her knife with her left hand, wrestles with her conscience. JMW Turner tries to bring together many of the elements in this tragedy in his ingenious Vision of Medea (1828), which he painted when staying in Rome with Sir Charles Eastlake during the autumn and winter of 1828. Jason has abandoned Medea for his new bride Glauce (or Creusa), and Medea is now in the midst of an incantation to force his return. In the foreground are the materials which she is using to cast her spell: flowers, snakes, and other supplies of a sorceress. Seated by her are the Fates. In the upper right, Medea is shown again in a flash-forward to her fleeing Corinth in her chariot drawn by dragons, the bodies of her children thrown down after their deaths. 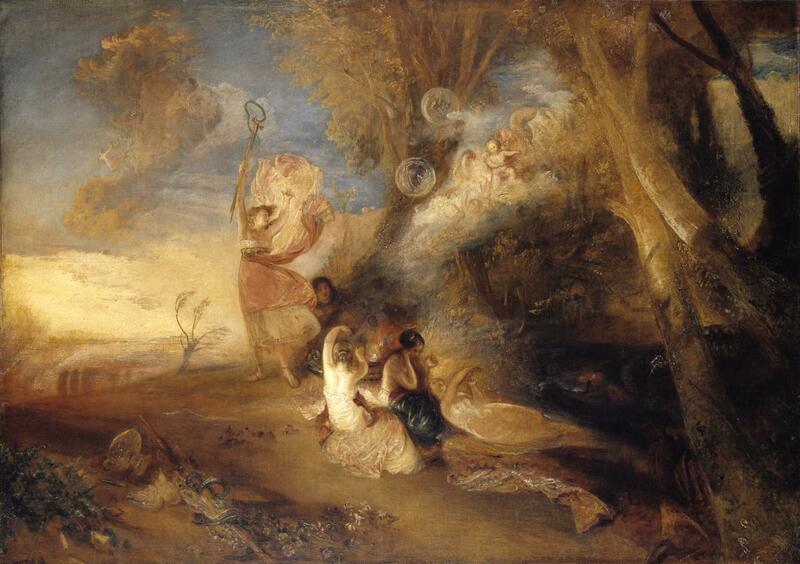 Turner didn’t show this painting at the Royal Academy until 1831, where it was considered to be a wonderful “combination of colour”, but generally incomprehensible. We are fortunate to have a series of fine paintings which show the sequence of events leading to the downfall of the sorceress Medea. Posted in General, Language, Life, Painting and tagged Dadd, de Tours, Delacroix, Jason, Klagmann, Medea, Metamorphoses, myth, narrative, Ovid, painting, Turner. Bookmark the permalink.